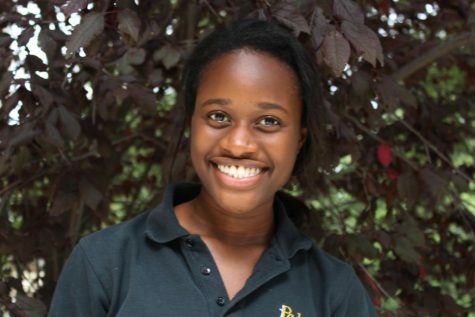 Olive Twum-Danso is a senior at Padua. She has been here all 4 years and enjoys it here. She has been running track since freshman year. Olive likes going to the beach in the summer and would like to go to the Bahamas later in her life. Her favorite subject is english and her least favorite is math. Olive runs the 100, the 200, and the 400. Her field events are long jump and triple jump. She enjoys triple jump and the 200 the most. When Olive isn't running she likes to go the beach and hang with friends, and sometimes even goes to concerts! Olive likes to eat sushi at Mikimotos because it is her favorite food. She decided to go to Padua because her sister went here. When she came to shadow she really liked it, especially the sisterhood part. She picked Multimedia Journalism because Olive likes writing stories and reading them on Snapchat. Last summer Olive helped move her sister into college and went to Wildwood, New Jersey to go to the beach. Olive is most excited to graduate from Padua this year.